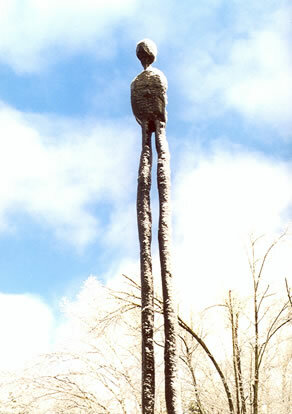 She carves her sculptures out of the trees surrounding her and in her latest outdoor installation "The Incurious Seekers" the trees seem to be transformed into 18/20 feet tall human figures that grow out of the ground and reach to the sky. Next to chisel, axe and chainsaw, fire is an important element in the creative process. Although the human figure always has been the focus of Blaas' sculptures, lately her work has moved into more abstract hanging installations, like the 12 feet long spoon/spadelike wooden forms that move in the wind. She has exhibited all over New England and taught numerous workshops, classes and school residencies. Through the residencies she seeks to give the students a real experience of 3D by executing a large sculpture with the entire school, often using "affordable" materials such as twigs, branches, scrap wood, cement, teaching them how to work with hand tools and how to get a sense of the framework needed to make a sculpture stand up. The subject matter is chosen in close agreement with the school's curriculum. Available for residencies and workshops all year round in New England. Cost: $300 per day.